Most people wouldn't think that making a grilled cheese over a campfire is possible. However, this recipe will teach you a couple methods of making a traditional grilled cheese depending on what cooking utensils you have on hand. Most of the time you don't have a cast iron pan when you are camping, but we have provided directions on how to cook this recipe with and without a pan below. 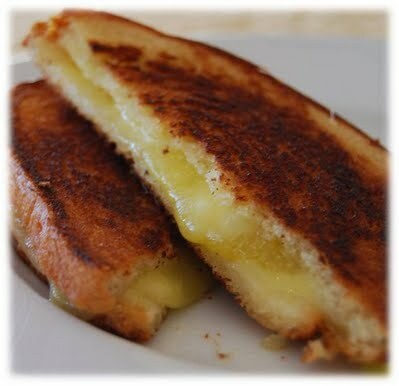 Read the step-by-step information below to make the perfect grilled cheese sandwich next time you are around the campfire. Sometimes you have to improvise when it comes to camping. Thinking outside the box to cook with limited resources is what makes camping enjoyable for some. If you are less the McGuiver type and prefer to plan your next camping outing before you go, skip ahead to the next section below to learn how to make this recipe with a cast iron pan. This first method is truly what they mean when they say you are,"roughing it." First, find a stick around your campsite that forks out into 2 or 3 small prongs that will be thick enough to hold up your grilled cheese sandwich. You may. Have to snap the branches to get the stick to a manageable size. Then put your stick over the fire to burn off any bacteria and rub off any loose debris. Prep your grilled cheese by buttering the outsides of the bread and sticking a couple slices of American cheese in the center. Rake some of the hot coals from the outside of your fire to the side to create a small bed of coals to cook over. Place your grilled cheese on your makeshift stick that you will use to hold over the small bed of coals. The prongs that fork out from the end of the stick should provide enough support to hold your grilled cheese, but be careful not to move it too much or it may topple over into your coals and you will have to start over. The cooking time for your grilled cheese will depend on how hot your coals are and how high you hover the bread over them. Typical cooking time is roughly 2-3 minutes per side. The first time you attempt this we recommend holding it higher up to avoid burning the bread. A good distance is about 4-5 inches above the coals. A cast iron pan is a great item to add to your camping equipment checklist. It can provide a variety of cooking uses and makes campfire grilled cheese especially easy. Cast iron is also the perfect material that will hold up to the heat of the fire without destroying the coating on the pan. That is something that your average household pan won't be able to withstand and we don't recommend trying this with anything other than cast iron. To start, Simply rake some of the hot coals from the outside of your fire to the side to create a small bed of coals. Next, place your cast iron pan directly on the coals to start warming up as you prep the grilled cheese. Lay your buttered grilled cheese sandwich on the pan. Since the pan is already hot, cooking time on your grilled cheese will be quick and you will need to watch it closely to avoid burning the bread. Typical cooking time is about 90 seconds per side.